Limit all site disturbance to 40 feet beyond building perimeter; 10 feet beyond surface walkways and parking; 15 feet beyond primary roadway curbs; and 25 feet beyond constructed permeable surfaces that require additional staging. NDv4 GIB Minimized site disturbance: 1 pt. 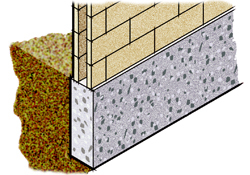 Concrete masonry, Proto IITM Wall Systems, pavers, and segmental retaining walls are unitized materials that do not require large equipment for placement, nor large staging areas. Proto IITM utilizes optimized footings that displace much less soil than conventional masonry fence and retaining walls. 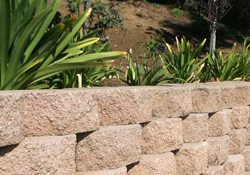 Segmental retaining walls respect the natural contours of the site, and do not require large footings and the associated soil displacement.